Metric Concrete Construction & Design Inc. has many years of experience with concrete techniques such as exposed aggregate. This process reveals the real beauty of concrete. 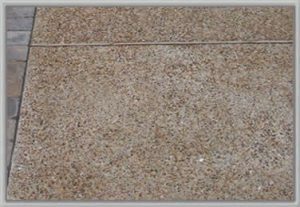 The process includes pea stones in the concrete mix which after pouring and finishing the cement has a retarder applied to prevent the top layer of the concrete from drying exposing the stones. As with all our projects, Metric Concrete Construction & Design Inc. provides homeowners and businesses beautiful designs and quality finishes.